With its early development hampered by a number of flaws the Typhoon or 'Tiffy', as it was nicknamed, was very nearly cancelled, but with hard work these problems were overcome leading to a excellent low-level interceptor and fighter-bomber. 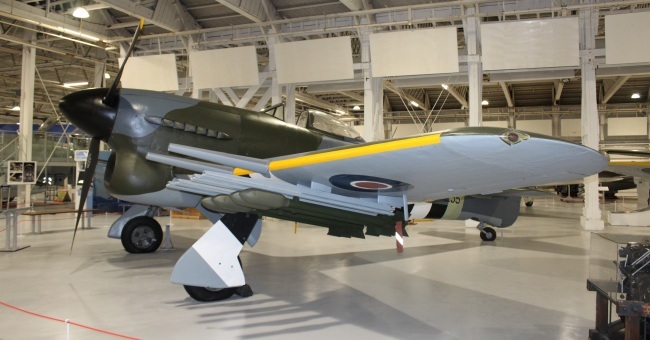 It would be during the liberation of Europe that the Hawker Typhoon would show its prowess. In expectation that the Air Ministry would require an aircraft to replace the Hawker Hurricane in the future Sydney Camm had began design work on a new aircraft in 1937. So when Specification F.18/37 was issued requiring a fighter powered by the Rolls-Royce Vulture or Napier Sabre engine and armament consisting of twelve guns, Hawker had most of the basic design ready and took the decision to produce two fighters. The Type N powered by the Sabre and the Type R powered by the Vulture. So on the 3rd March 1938, just two months after the introduction of the Hurricane into service, two prototypes of each aircraft were ordered by the Air Ministry. The Rolls-Royce Vulture powered Type R would go on to become the Tornado but with the cancellation of the Vulture engine by Rolls-Royce the aircraft would not be ordered into production, although it did provide the basis for the Hawker Tempest Mk II. This left the Napier Sabre powered Type N, and it was this aircraft that would be developed into the Typhoon. With Philip Lucas, the chief test pilot for Hawker, at the controls the first Typhoon prototype made its maiden flight on the 24th February 1940. Featuring a cockpit built into the fuselage and a distinctive chin radiator, armament would consist of six 0.303-in machine-guns in each wing. Although early test flights were conducted with the aircraft unarmed. The development of the type continued but would be beset with problems. The first of these occurred on the 9th May 1940 when during a flight test the fuselage of the prototype failed, despite this the pilot managed to land. Time was lost as the aircraft had to be repaired and modified and by this time the German advance into Western Europe was almost complete so development of the Typhoon would slow down as production of fighter aircraft was focused on the Hurricane and Supermarine Spitfire in expectation of the upcoming Battle of Britain. 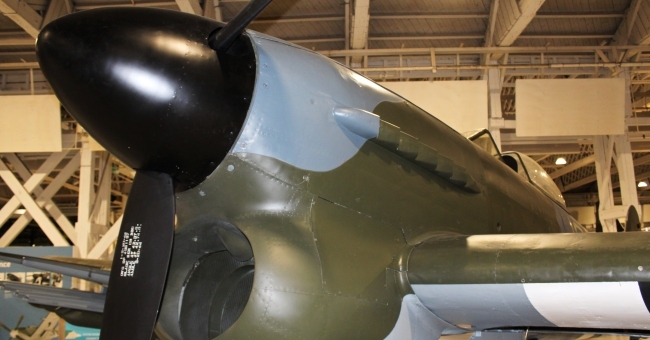 As 1941 began and the threat of imminent invasion passed the Typhoon, now designated the Mk IA, was ordered into production with the first example flying on the 27th May 1941. A couple of weeks prior to this the Typhoon Mk IB prototype flew on the 3rd May 1941. The Mk IB would be powered by the Napier Sabre II engine which gave over 2,000-hp giving the aircraft a top speed of 405 mph. If the pilot need extra power a short boost enabled the engine to provide around 3,000-hp. Range was 500 miles and service ceiling was 34,000 ft. The major change over the Mk IA was in armament with its twelve machine-guns being replaced by four 20mm cannons and able to carry either two 500lb or 1,000lb bombs, which earned the aircraft the nickname 'Bombphoon' or eight 60lb rocket projectiles. The Typhoon Mk IB was to be the preferred variant. 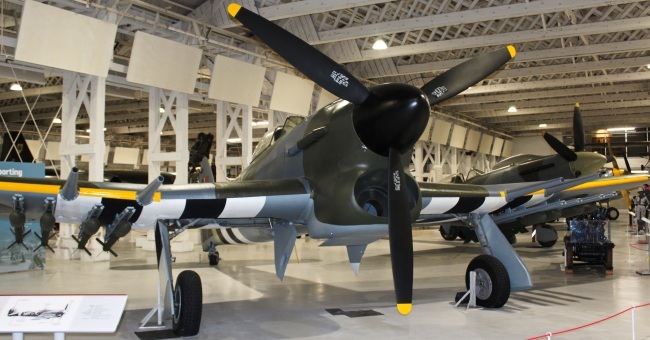 The first examples of the Royal Air Force's new aircraft were delivered to No.56 Squadron at RAF Duxford on the 11th September 1941 for trials and a couple of fatal flaws were found on the Typhoon. These issues threatened the aircraft's future and nearly lead to its withdrawal. One of these saw carbon monoxide leak into the cockpit as a result of poor sealing allowing engines fumes to overwhelm the pilot. This problem, despite improving the sealing, was never solved necessitating the pilot to use oxygen before starting the engine and until the engine had been shut down. The other pressing issue for the Typhoon was that the rear fuselage joint fatigued easily and lead to the tail section coming apart in mid-air which would require Hawker to provide a new, stronger, joint. Add on engine problems that wouldn't be resolved until 1943 and the types entry into service was anything less than smooth. There was some early success among all these problems for the type, when to counteract the Luftwaffe's low-level tip-and-run raids by Focke-Wulf Fw 190s, which had the measure of the Spitfire Mk V in service at the time, No. 609 Squadron were also equipped with the type and in its first week operating from RAF Manston shot down four Fw 190s during November 1941. It was as a low-level interceptor and ground attack aircraft that the Typhoon would be used as and development of the type was centred on this. The decision to use the aircraft in this role being influenced by its poor climb rate, which was worse than the Hurricane which it was meant to replace, and performance at high altitude. 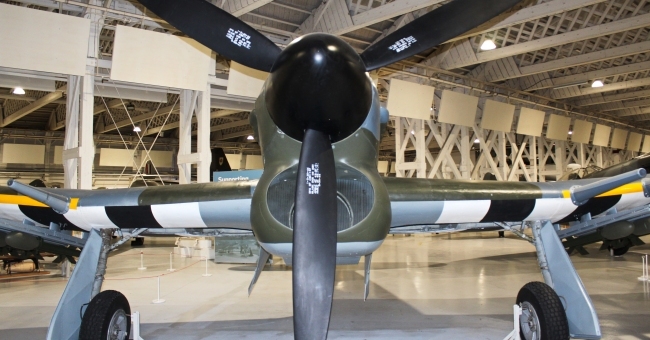 One further issue occurred with the Typhoon and that was its similarity at certain angles to the Fw 190 leading to the spinner of the aircraft being painted white and underneath the wings black and white stripes were painted, a precursor to the use of invasion stripes during D-Day, in an effort to curb friendly fire incidents. 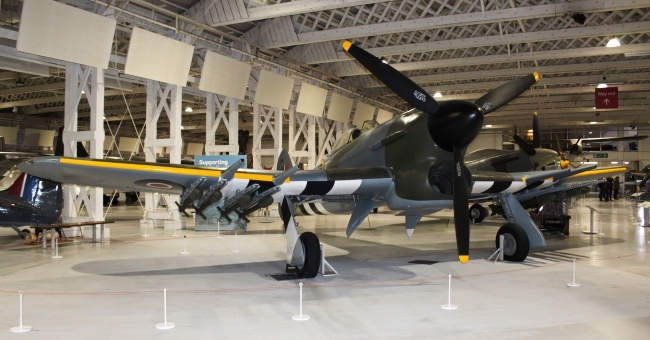 As the Typhoon started to overcome its problems and now fitted with a 2,180-hp Sabre IIA engine the aircraft started to show its potential as a low-level interceptor/ground attack aircraft and during late 1942 into 1943 attacked various targets in France and the Low Countries and was also used as a night intruder. When rocket projectiles were added to the type during late 1943 it became a very potent weapon and played a crucial role in the lead up and aftermath of D-Day. Operating from airfields along the South Coast and in co-operation with other Southern based squadrons of fighter-bombers they attacked a variety of targets in the build up to D-Day. These included shipping, bridges, communications, railways and anything else that would hamper the German response to the Normandy invasion. With the liberation of Europe in its early stages the Typhoon armed with rockets and as part of the 2nd Tactical Air Force was used for ground attacks. This lead to the development of the 'Cab Rank' which would see a constant patrol of aircraft at 10,000 ft and which would be called upon when required. The aircraft would prove invaluable in the role when dug in German tanks held up the Allied advance, and as soon as was possible the aircraft was operating in France enabling a faster response. 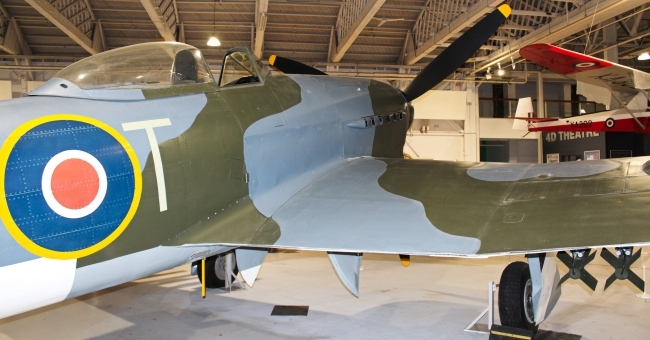 Development of the Typhoon Mk IB continued and another engine upgrade saw the 2,260-hp Napier Sabre IIC installed. 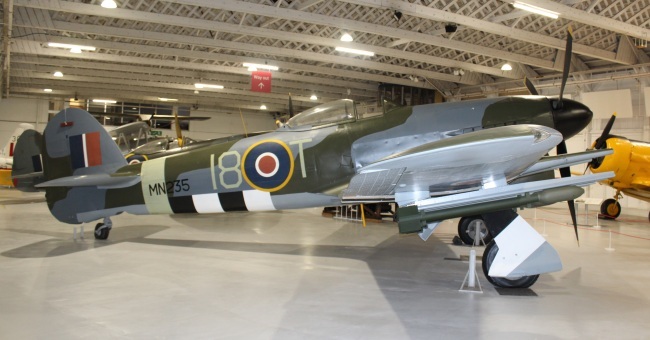 A Mk II version was also being worked on but this aircraft was very different from the Mk IB that it would be renamed and ended up as the Hawker Tempest. Although the Typhoon operated mainly as a low-level interceptor/ground attack aircraft a night fighter version was considered. Fitted with AI Mk VI interception radar a sole Typhoon NF Mk.IB appeared. Some examples were also converted into fighter reconnaissance versions of which two configurations existed, one with two vertical cameras added and the other had a camera replacing the inner cannon on the port side. All were designated FR Mk.IB. The Typhoon was now a valuable aircraft for the Royal Air Force and would operate close to the front line, taking part in many operations, and took part in 'Operation Varsity' (The crossing of the Rhine). However after VE Day its time in service was ending as it was replaced by the Tempest. In total 3,317 aircraft were produced of a type that very nearly didn't enter service.